Adults of any age and location in the area can have a card at our library free of charge. In order to be good stewards of the funds that are given to Groves Public Library, we must endeavor to ensure we know to whom and where our materials are going once they leave the building. We are the only library in Jefferson County that does not charge for a library membership. Please help us in our effort to help you by being a responsible library user. If you live in the area, and you want a library card at Groves Library, you do not have to pay a fee. You must be 18 years or older and agree to return your materials on time, to pay any and all fines that accrue as a result of our lending you materials, and pay for any most materials plus a processing fee of $5.00. You can also click on the fines and fees page to see our rules for circulating materials. Click here to print an application before you come to the library. You need to prove two things: who you are, and where you live. You will also be asked for an email address, and reference phone number. This reference must be someone who is not living with you. All patron information is confidential. We do not use your information on any mailing lists. It is strictly for library use. Our computer system will use your email address to notify you of overdue materials, and check out information. After you give us this information, we have you fill out a self-addressed envelope and we will in turn mail that envelope to you. Once you receive that envelope, come back to the library and you will be given your GPL library card. The day you make application, you are allowed to check out two print materials. This is called our address verification process. We know it is a hassle, but really we have to do our best to make sure we know where our materials are going. So needless to say, if an adult walks out with 8 items, two of which are DVDs, then they could be leaving with almost $200 worth of material. Can I get a card for my child(ren)? We prefer that a child be at least 6 years old before getting a library card. Each child in a family will be eligible. Children are considered "students" in the computer system until they reach the age of 18. During that time, the parents or whoever signs for their cards are responsible for paying their fines should they accrue any due to not returning or losing their materials. Adult cards and children cards are linked in the computer system, if one family member is in default, the whole family will be suspended. How many items can we check out? Adult cards are allowed 8 items, two of which may be DVDs. Children are not allowed to check out DVDs on their card but they are allowed to 6 items on their card. How do I Renew my card? Must I have my card with me when I check out? Any time you change addresses, phone numbers, or any pertinent information, please remember to change this information on your library card. Cards expire every year and must be renewed. Remember to bring your library card with you when you visit the library. You will need it scanned by the system to check out your materials. This is for your protection. It will ensure that items showing up on your electronic record were really checked out by you. If you lose your card, there is a $1.00 fee for a new card. You will be given a new library card number. If after you get a new card, you find your old one--please remember to destroy the old one by cutting it up so that it won't be used by someone other than you. Seniors (65 and over) pay only 50 cents for a new library card. If your library card is stolen, please notify the library at once at 409-962-6281. Can I waive address verification? 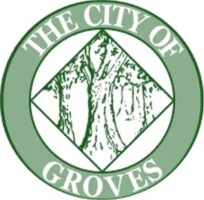 Staff is given permission to waive address verification for any resident who can show that they are a member of a Groves civic organization, such as the Groves Rotary, Beautification Committee, Groves Chamber of Commerce, Groves Masonic Lodge, Order of the Eastern Star, or Knights of Columbus. In addition we will waive the address verification process for members of the clergy at a Groves church. members of the Groves Fire Department, Groves Police Department or Groves city department heads are also exempt. What if I am a student or faculty member? We are able to designate you as faculty in our system allowing you to check out as many as 20 books per visit. Patrons who wish to be designated as faculty will need to present written proof that they are currently employed in a school district as a classroom teacher , or a potential student teacher who is required by coursework to read children's books. If you are a student teacher, you will need to tell the staff the name of the school you attend, grade you are currently teaching, and a phone number of the school where you can be reached. Persons who homeschool may also be designated if you furnish staff the name of the organization they teach under, or the name of the curriculum you are using. Persons designated as faculty may only be allowed extra check-out during the school terms--August to May of each year. Checking out holiday books such as Thanksgiving, Christmas, Fourth of July, these books have a check out limit of 5 books per circulation in order for the library to have enough books to circulate to regular patrons for the holidays. Is there ever an instance where I can lose my borrowing privileges? misbehaving in the library can cost you to be welcomed back into the library, therefore suspending your account. If you have a fine, un-returned materials or your account is suspended, you will also be suspended from using our library computers.